It’s the holiday season and let’s just be honest – I’m busy. SUPER BUSY. With finding the perfect gifts for family members, wrapping 60 books for classmates, and baking a few cookies, letter learning seems to be put on the back burner so to speak. 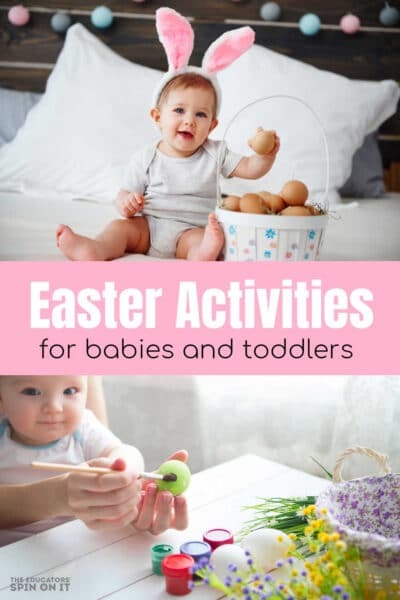 I’m all about cute Christmas learning crafts, but what I need is an activity that will entertain my kids for more than 5 minutes and not make a giant mess. Is there such a thing? Of course! 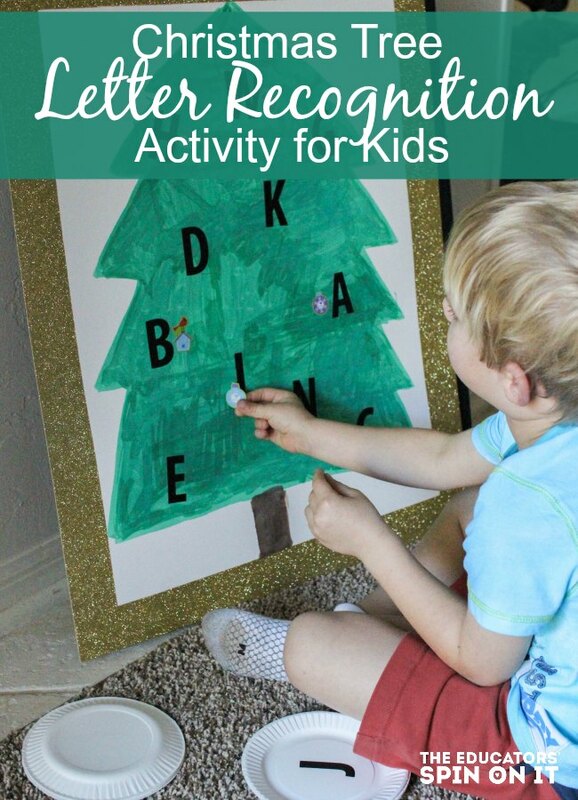 Bring a little learning into your holiday season with this adorable Christmas tree letter recognition activity. It’s a hit with the kids, easy to prep and you can play it for a LLLLLOOONNGGG time. 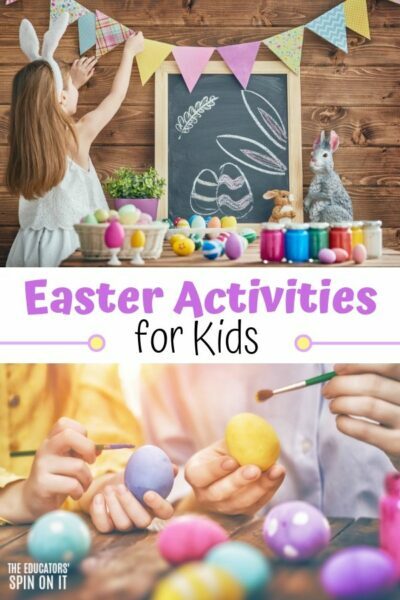 Make once – play a bunch = Activity WINNER!!!! Tiny stickers – holiday themed stickers work well, but really any small reward sticker works. A special thanks to Art Skills for sending us a pack of art supplies to create with! 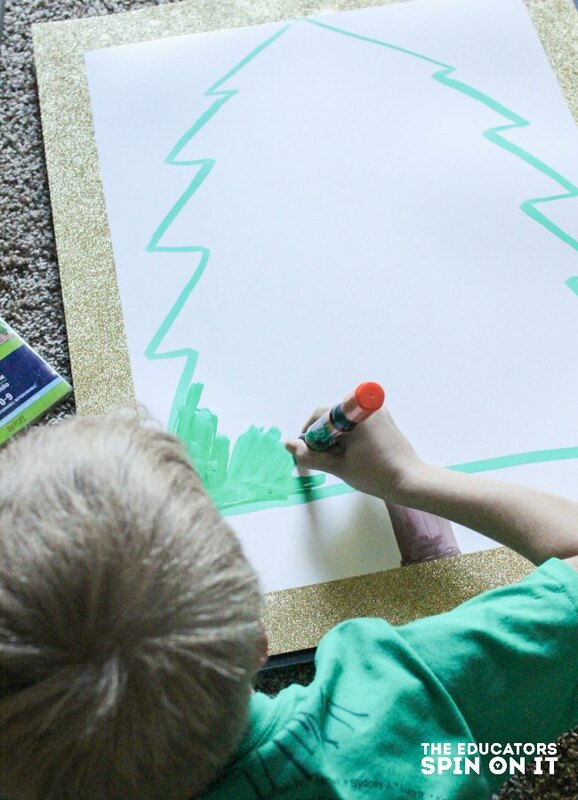 First, draw a giant tree on your poster board. 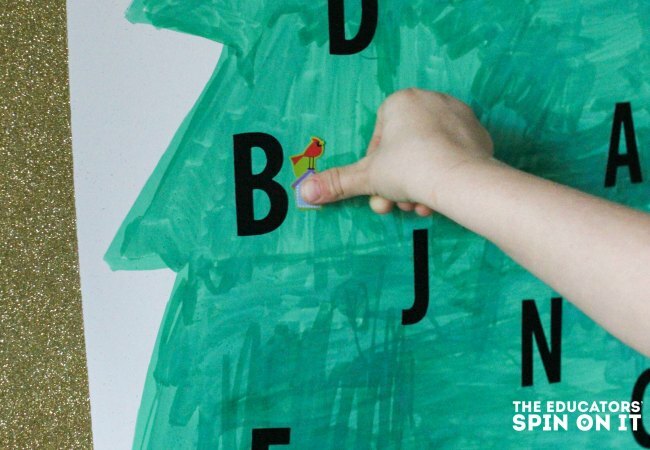 Then, place 10-15 alphabet stickers on the tree. Make sure to give each letter enough space for stickers to be placed all around each letter. Last, make a set of flash cards. 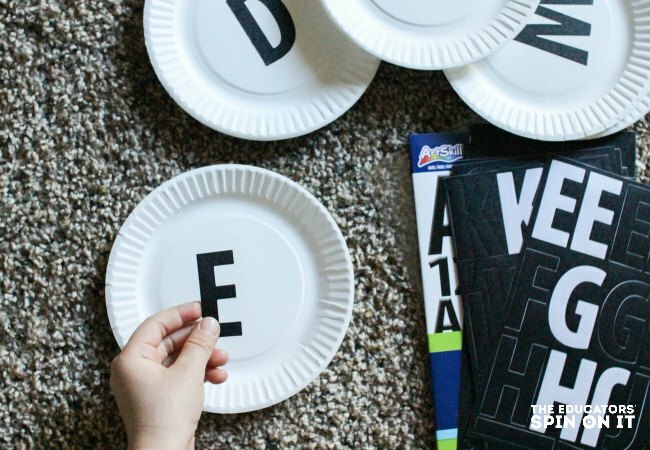 Put a matching letter sticker on each paper plate. 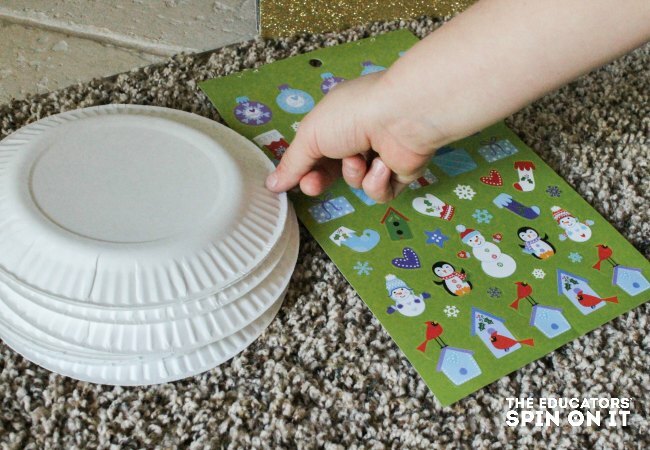 If your tree has an A sticker, then there should be a paper plate with the letter A. I like to use small paper plates because they are big enough for small fingers to grab and strong enough to be used over and over again. 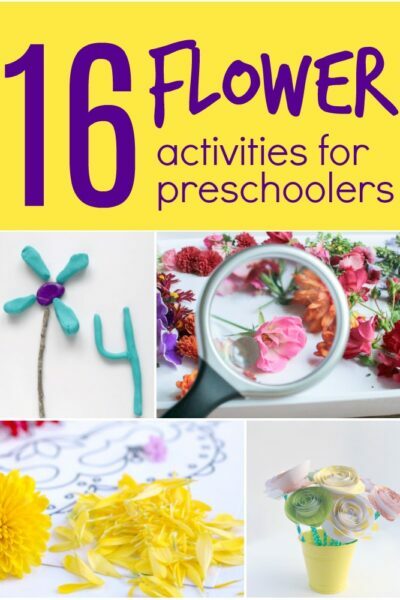 Plus, you can use them for even more alphabet recognition activities! 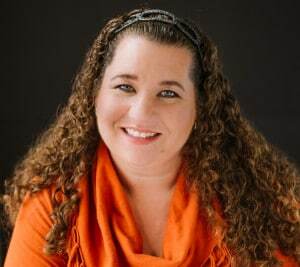 Love letter learning? 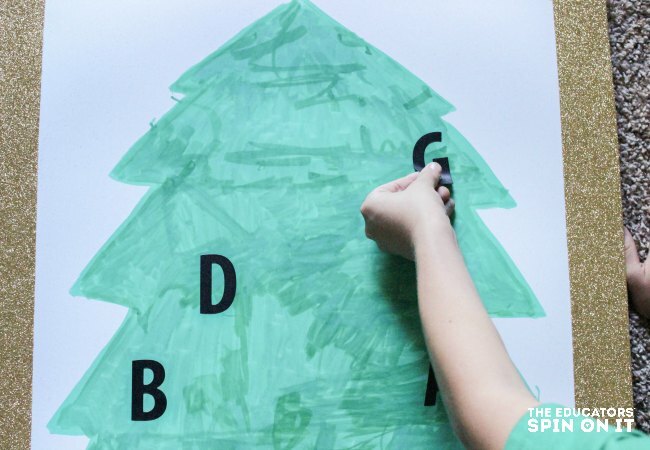 Try this variation of an Alphabet Christmas Tree Activity. Then, draw one alphabet card from the pile. Turn it over. Say the letter name AND the letter sound. Alphabet recognition is knowing the letter name when you see it in print, but I can’t resist the opportunity to help connect the sound with the letter name and how it looks. Next, find the letter match on the tree. Once you have found the letters match, then it’s time to decorate the tree. Take a sticker and place it next to the letter on the tree. The sticker can be above, below, to the left, or to the right, BUT NOT ON. My little one was testing me and put a sticker on the letter and giggled. I just took it off and explained the rules. If they put the stickers ON the letters, then letter recognition becomes difficult and you can’t play the game for the rest of the week. Continue until all the ABC cards have been turned over. Each of the letters on the Christmas tree should have 1 sticker ornament. Repeat the next day and the day after that. 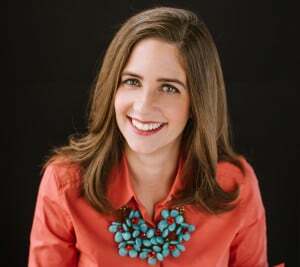 If your child is like mine, they may be begging to play it again and again. Truth: I only “let” them play the Christmas Tree Letter Recognition Activity one time each day. 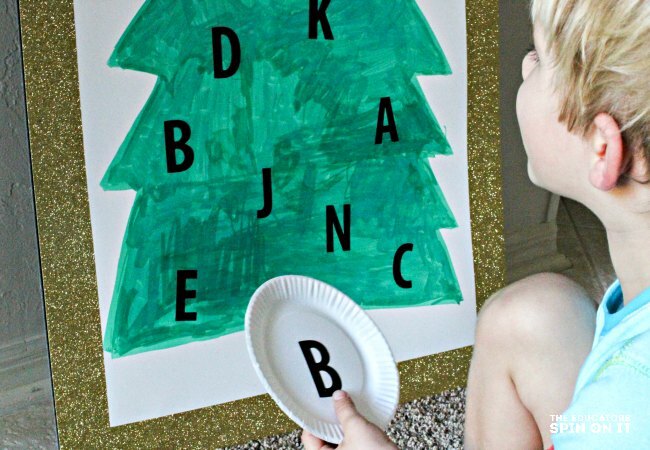 After one time through the alphabet cards, we put the ABC tree away and do another activity. It keeps excitement about letters high. “Mom, Can I practice my letters PLEASE?” – my 4 year pleaded holding up the stack of paper plate alphabet cards. 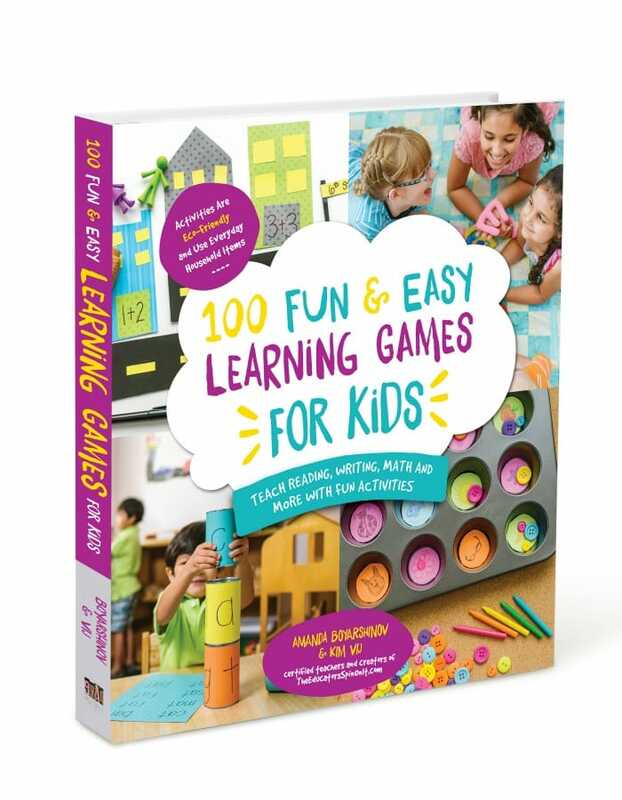 From “What’s missing” to “Alphabet Hide and Seek” here is a list of quick and active games for children to play that give them even more opportunities to recognize the ABC’s. Is your child able to Identify the ABC’s? YEAH! Do the happy dance! Give them a hug and celebrate. How do you teach the letters of the alphabet? ABC Order with Giant Pool Noodle Alphabet Beads.